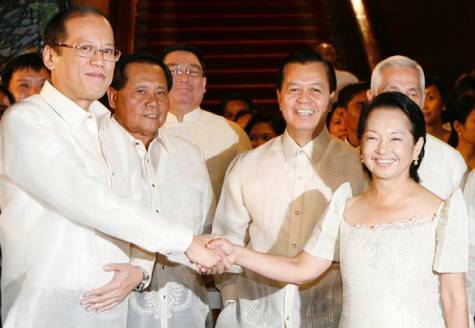 SONA 2011: Is Aquino sincere in making Gloria Arroyo accountable? In the run-up to the second State of theNation Address (SONA) of President Benigno S. Aquino III, his camp has been playing up the theme “despite the great problems left behind by the corrupt Arroyo legacy, the seeds of change have been planted.” This premise both justifies the shortcomings of Aquino and draws the false image of a presidency bent on implementing its reform agenda amid the challenges. Malacañang also dismisses critical Filipinos as simply “so negative” which according to Undersecretary Manolo Quezon III, is Aquino’s “biggest frustration as President.” Quezon complained that “people are quick to say you can’t do it… nothing will happen.” But really, the people are simply asking, what has happened to the promises of Aquino, foremost of which is making Mrs. Gloria Arroyo accountable? What are the supposed seeds of change planted by the Aquino administration in the past year? Malacañang and its supporters trumpet what they call important battles won against corruption, which has been Aquino’s banner campaign since the elections. In fact, Aquino clinched the presidency riding on an anti-corruption platform with the prosecution of Gloria Arroyo as the main goal. Supporters point to the resignation of Ombudsman Merceditas Gutierrez as proof of the dogged intent of the President to put Arroyo behind bars. Aquino openly supported demands for Merci to quit instead of going through the arduous process of impeachment trial. With Merci out of the picture, the prospects of making Arroyo accountable have vastly improved. Alas, more than two months have passed since the pro-Arroyo Ombudsman was forced to resign, there’s still no actual case filed by Aquino against the former President. The botched Truth Commission is supposed to be already holding tons of evidence proving that Arroyo, her family and allies had enriched themselves through massive graft and corruption. Yet, until his first year speech, all Aquino can offer are tirades that, sans concrete action, have lost their meaning. Meanwhile, progressive anti-Arroyo groups have remained determined to pin down Arroyo. Partylist group Bayan Muna filed graft, malversation, and plunder raps against Arroyo before the Ombudsman over the alleged misuse of at least P325-million Philippine Charity Sweepstakes Office (PCSO) funds. The funds allegedly were used for political largesse, partisan electoral purposes, and simply pocketed. Migrant workers’ group MIGRANTE International and former Solicitor General Frank Chavez also sued Arroyo for plunder over the alleged misuse of P530-million Overseas Workers’ Welfare Administration (OWWA) funds. According to them, the funds were used for questionable purposes that did not benefit OFWs such as for health insurance cards to eight million indigents just a year before the 2004 presidential elections. Peasant group Kilusang Magbubukid ng Pilipinas (KMP) has also asked the Ombudsman to include Arroyo in the earlier plunder case it filed against ex-Department of Agriculture (DA) Undersecretary Jocelyn “Joc-Joc” Bolante in relation to the P728-million fertilizer fund scam. The money was supposed to be used for the purchase of fertilizers to help the farmers but was diverted to help bankroll the 2004 presidential bid of Arroyo. Aside from corruption, legal cases also hound Arroyo for grave human rights violations such as the P15-million civil suit filed by six members of the Morong 43, a group of health workers illegally arrested and tortured, and detained for 10 months by the Armed Forces of the Philippines (AFP). Its failure to file a case naturally raises serious doubts about the resolve of the Aquino presidency to go after Arroyo. The pretext that government would rather take it slowly but surely is a lame excuse. One year is long enough to build a strong case especially if you have the entire machinery and resources of government at your disposal. Remember that it only took three months for Arroyo to file plunder cases against deposed President Joseph Estrada before the Sandiganbayan. This is where Aquino’s supporters miss the point when they complain that critics are impatient. Change is a long process and it does not happen overnight, they point out. But who asked Aquino to change the country overnight? Who asked him to shortcut the process? What people ask is pretty simple, doable, and concrete – file at least one case. But Aquino had already missed the historic opportunity to do this in his first year. It’s not farfetched that for all the noise in making Arroyo accountable, the Aquino administration may be willing to compromise in the name of political expediency. Or maybe Aquino and his advisers have realized that politically, it is better that Arroyo is kept out of jail because as long she’s free, Arroyo is a convenient excuse to justify Aquino’s inadequacies and an easy target to gather popular support. This has been observed in the events following recent reports by the Social Weather Stations (SWS) and Pulse Asia showing the continuous decline in people’s satisfaction over the performance of Aquino. The “revelations” by Zaldy Ampatuan, former Governor of the Autonomous Region in Muslim Mindanao (ARMM) and one of the primary suspects in the Maguindanao Massacre, of the massive electoral fraud and corruption in Maguindanao involving Arroyo and the subsequent resurfacing of ex-Commission on Election (COMELEC) supervisor Lintang Bedol to corroborate Ampatuan’s allegations of cheating in the 2004 presidential and 2007 senatorial polls have shifted public attention from the non-achievements of Aquino to the numerous crimes of Arroyo. Is Aquino just utilizing the strong anti-Arroyo sentiment to cover up his own failures and address the growing disenchantment of the people in the run-up to his SONA? But at what cost? Will it be at the expense of the victims of the gruesome Maguindanao massacre and their families? In the name of justice, Arroyo must be made to pay for her many crimes against the Filipino people. Aquino made the people believe that he will do just that and was made President in the process. But in the world of elite politics reigned by self-serving interests, many things are not as straightforward as they should be.